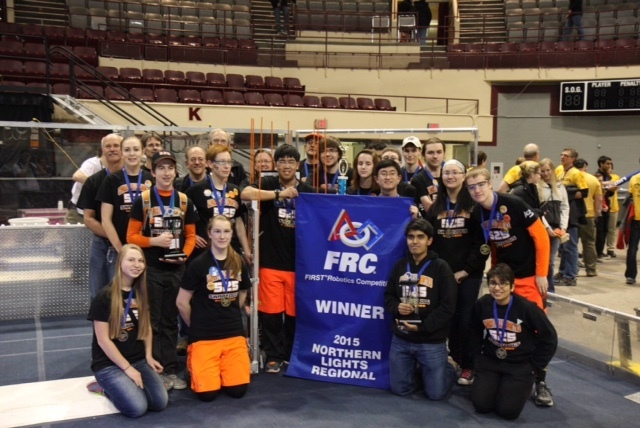 Our first regional this year was the Northern Light Regional in Duluth, Minnesota. It was a week 1 event, but we were ready and excited to compete. After qualification matches we were ranked 2nd with an average score of 92.2. We were picked by the 1st seed, 3130, and were joined by 4215, and won the event! We also received the Imagery Award (we suspect this may be about our drive team’s very stylish orange shorts. Our second competition event got off to a great start, being joined before in our Cedar Falls build site by 2 Chinese teams. We had the honor of showing them around our school and leading them in a couple of workshops to get us ready for the regional. We would find out at the regional that these teams would be placed in the pits next to us, the FIRST organizers knowing we would be willing to always help our rookie friends. After a great meeting, we attended our second regional. The Minnesota 10,000 Lakes Regional was a week 6 event in Minneapolis. We ended qualification matches ranked 1st with an average score of 117.78. 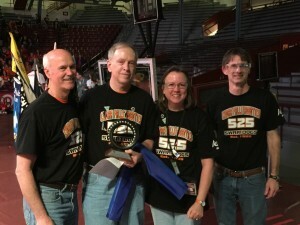 We partnered with 2502 and 3185 and ended up winning the event! We were honored to receive the Excellence in Engineering Award. 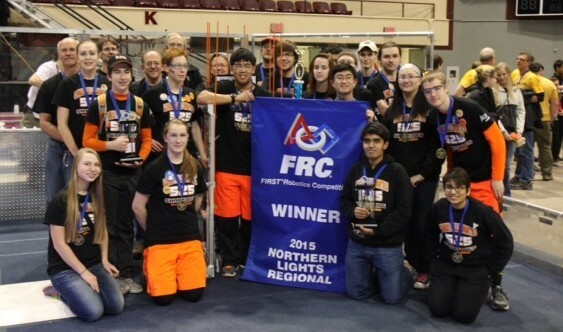 We were also thrilled when Neil Kruempel became our 4th mentor to receive the Woodie Flowers Finalist Award. As it normally is, the Championship in St. Louis was intense. This year it grew to include 600 FRC teams and had over 40,000 people in attendance! We were excited to be seeded 3rd after qualification matches and ended up captain of the 3rd seeded alliance. 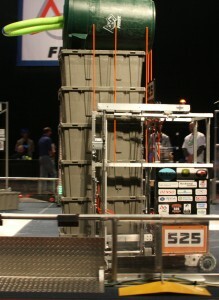 We partnered with teams 1595, 2052, and 2990. While we had a strong alliance, we were eliminated after the quarterfinal matches. We spent the rest of the day watching other playoff matches and matches on the Einstein fields before we headed back to Cedar Falls. This year’s game is Recycle Rush. Points are scored by placing gray totes on scoring platforms, and extra points earned by capping a stack of totes with a recycling container. Pool noodles (litter) can be scored in recycling containers or by human players throwing them across the field. Both alliances can work together to earn a Coopertition bonus by scoring yellow totes on the step in the middle of the field.